Reports from England suggest Arsenal are interested in signing Barcelona’s Ousmane Dembele in a bid to strengthen the club’s wing option. Daily Express referenced Website Football.London by claiming that Arsenal’s chief Sven Mislintat is keen on signing the World cup winner from Barcelona. It was also reported that new coach Emery is very much interested in bringing the winger over to Emirate as he can utilise his talent and also boost his squad capability in the new season to come. The 21-year old was signed to Barcelona for a huge deal worth €105million plus €40million for add-ons, he is a valuable player that has made some major contributions in ensuring a win for the club. 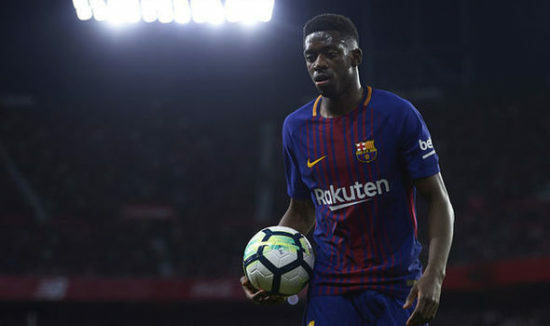 However, Mislintat was reported to have oversaw the move that took Dembele to Ligue 1 side Rennes but he couldn’t perform as he struggles in his first season. On the other hand, Arsenal lost to Manchester City last season in the League cup and they don’t want a repeat of that as they tie all lose ends. Following the signing of Juventus’s Stephan Lichtsteiner, Bayer Leverkusen, Dortmund defender Sokratis Papastathopoulos and Matteo Guendouzi from Lorient, coach Emery might be left with no choice but to lose some players in order to facilitate the deal for Dembele and provide Barcelona’s asking price.